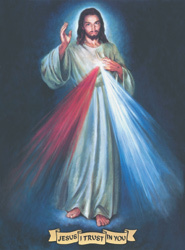 The origins of this image are associated with the vision that Saint Faustina of the Congregation of Our Lady of Mercy had in the convent in Poland on 22nd February, 1931. It is of course the sacraments of Baptism and Reconciliation that purify the soul and the sacrament of the Holy Eucharist that is the life of the soul. Thus Jesus is again directing us to this infinite source of His mercy and love. The veneration of the image is based on confident prayer joined with deeds of mercy, to which Jesus attached the following promises; the grace of salvation, great progress on the road to Christian perfection, the grace of a happy death, and all other graces and temporal blessings which people who practice mercy will ask Him for with trust.